In December 2007 I did research on the demographics of Facebook users. The research was popular with several universities utilizing the research along with many websites referencing it too. I am doing a 2007 vs 2010 comparison because Facebook has changed a lot since then and I expect people would appreciate the updated data. Facebook’s US members have grown from 22 million to 130 million in 3 years. In 2007 Facebook was the 8th most popular website in the world according to Alexa, now they’re the second most popular in the world behind Google. It is impressive growth, but I won’t be making any guesses as to why, I will just give you the figures. I’ll start with the age of Facebook users. 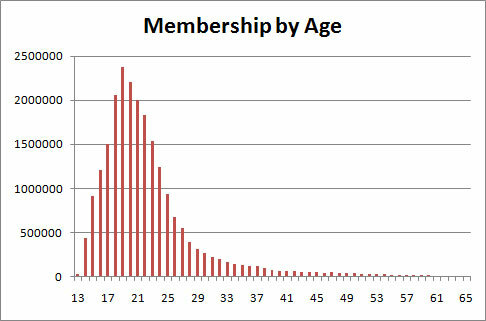 In 2007 the age of members was a perfect right skewed distribution peaking at 19 years old, so 19 years was the most common age. There was barely any 13 year old members, very few over 30 and even less over 40. Skip to 2010 and the perfect distribution is gone. It is now a right skewed but imperfect distribution peaking at 20 years old. The number of 13 year old members has increased but is still minimal. The most significant change is the surge in membership with over 30 year old members. The number of older members has increased from tiny to significant. The ratio of males to females in 2007 was 1.22, in 2010 that ratio has increased to 1.27. As percentages, in 2007 there were 55% females and 45% males. In 2010 there are 56% females and 44% males. A small, but interesting change. The education level of members has changed dramatically. 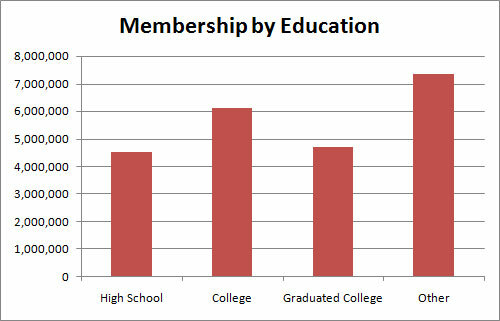 In 2007 almost half of members were studying in either high school or college. In 2010 87% of members are graduated from either high school or college. Now there are far more members who have graduated from high school, but not from college. 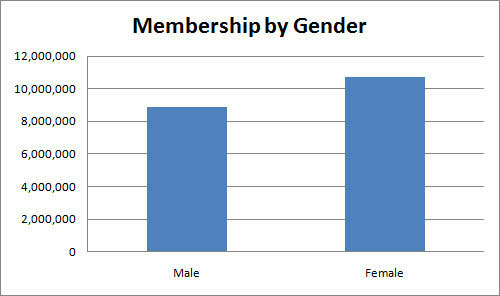 This is a big changed which relates to the change in the age distribution of members. I hope you find this update useful. The internet is certainly fast changing with these significant changes happening in only 3 years. The next 3 years will surely also bring many big changes.